design and create the development trend of the product. 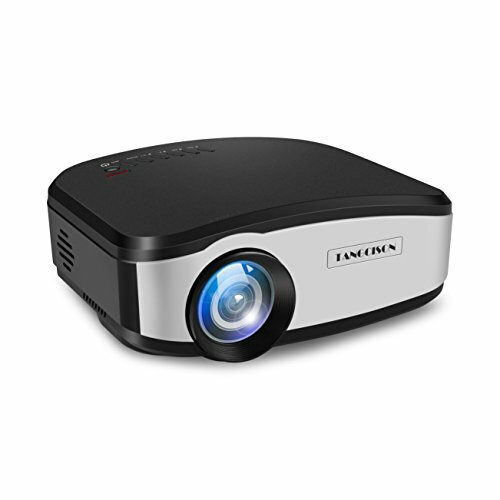 4) TANGCISON mini home projector with built-in speaker, it also can be connected with an external speaker. 1. High Resolution and Brightness Video Projector: Our video projector support full 1080P HD video, Super clear images projector, the silhouette of face and villi are clearly visible in dark. Image size: 30-160 inches (best size 50 -120 inches) Ideal for indoor & outdoor entertainment. 2.High Performa Video Projector: Variable Audio-Out function and stereo speakers,Noise compensation . Native Resolution:800*480; support 1080P, the contrast of 1200:1 Displayable Colors:1.67 Million, Aspect ratio:16:9/4:3,Keystone Correction:15° Projector LED Lamp Life:50000+Hours, no need to replace the lamp for 20year (5 hours/day). A dark environment with highly reflective surface will give you the best picture quality. 3.Smart Phone Connection with Tangcison Home Projector, Music, Pictures, Videos from your smartphone can be Synchronous transmission to the portable projector with a HDMI adapter. (Please purchase a HDMI ADAPTER seperately). 4. Multiple Inputs Home projector: HDMI(Support 1.1-1.4) , VGA, USB, AV, Compatible with Computer/Laptop/Mobile/iPhone/iPad /Blu-ray DVD Player, PlayStation PS3 PS4 or X-Box X-360 X-One through HDMI port. Supported :Music, Picture, Video, TXT, Projection Method:Front,Rear,Suspened Ceiling. 5. TANGCISON home projector with manual keystone correction, adjust the trapezoidal distortion and get a best viewing at any angle. Only 2.07lb and Mini Size 8.0inx6.1inx2.9in . Change the lens with image focus to get a super clear image. Powerful cooling system and noise reduction function,as quiet as a laptop. If you have any questions about this product by TANGCISON, contact us by completing and submitting the form below. If you are looking for a specif part number, please include it with your message.